Un-jumble these keywords 1.ialWmli 2.adarHl 3.loarHd 4.odyrNnma 5.Nywora 6.aaadrhdr 7.wsoogdhnni 8.onhtasdfr drihge 9.gahstins 10.soeshr 11.usHaroecls. 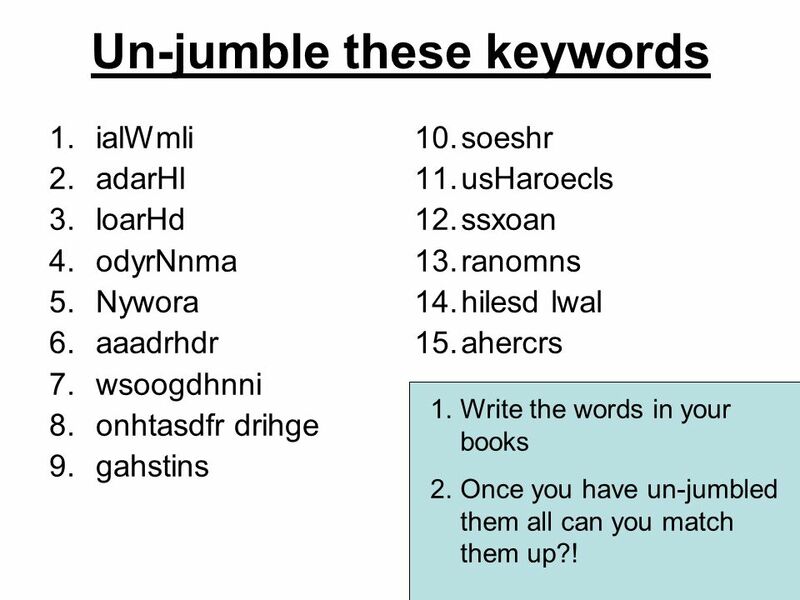 1 Un-jumble these keywords 1.ialWmli 2.adarHl 3.loarHd 4.odyrNnma 5.Nywora 6.aaadrhdr 7.wsoogdhnni 8.onhtasdfr drihge 9.gahstins 10.soeshr 11.usHaroecls 12.ssxoan 13.ranomns 14.hilesd lwal 15.ahercrs 1.Write the words in your books 2.Once you have un-jumbled them all can you match them up?! 2 WHO WON THE BATTLE OF HASTINGS? WHY? Make a decision to what you think the most important factors are. 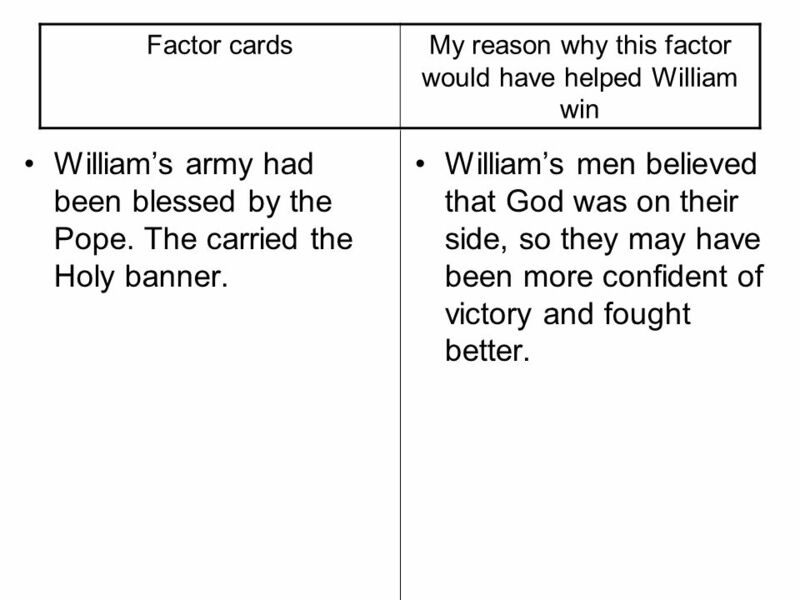 3 Factor cardsMy reason why this factor would have helped William win Williams army had been blessed by the Pope. The carried the Holy banner. Williams men believed that God was on their side, so they may have been more confident of victory and fought better. Download ppt "Un-jumble these keywords 1.ialWmli 2.adarHl 3.loarHd 4.odyrNnma 5.Nywora 6.aaadrhdr 7.wsoogdhnni 8.onhtasdfr drihge 9.gahstins 10.soeshr 11.usHaroecls." Fact or Phooey!!! Just how much do you know?. Fact or Phooey!!! Gideons army only took a horn, a jug and a lamp into battle. Quest ion 1? A.) answer B.) answer C.) correct answerD.) answer L C.) correct answer F.